I experienced Remote Encounters in Cardiff; April 11th and 12th, 2013. A conference organised by the Cardiff School of Creative and Cultural Industries from the University of Glamorgan. Escaping from the over-constructed city centre, on an early morning I go to find the bay. I hold the torch of the World Harmony Peace statue, to connect with others’ wishes for peace in the world. I am connected with many people using no physical equipment. Holding the torch connects me. The bodily sensations at that moment are triggered by external stimulus of the sense of touch; I was wondering about internal stimulus, like sound that comes into our bodies when we listen. I imitate the many sounds of the many seagulls; do they imitate my sound, their sound? Sound is touching our bodies outside and inside. Our mind can scan the inner body, as can the food: internal touch. At the conference, I noticed how deconstructing my work is the only way to present it. This is the manner in which it comes to life in many different ways. I am more comfortable with the realisation of this… Networked Migrations’ life. I also noticed that most people working on networked performance live in-between different cities and countries. We hold many identities and languages, and we materialise these in networked performances of all kinds. We are creating new aesthetics, new sensibilities. Our sensibilities are changing. 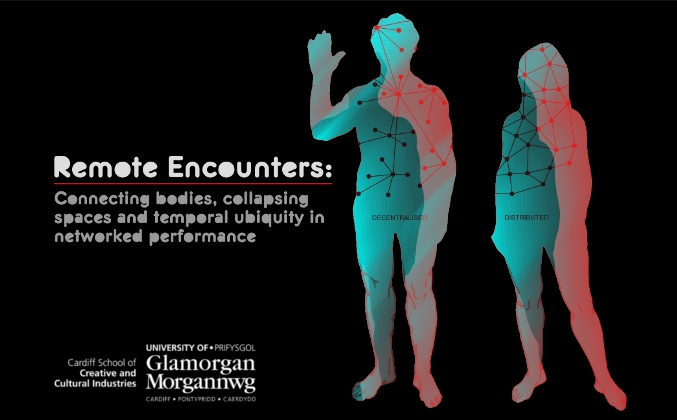 There is a forthcoming publication of the papers and performances experienced at Remote Encounters, in ‘Liminalities: a Journal of performance studies‘! This entry was posted in Conferences, Telematic Sonic Performances on May 29, 2013 by xadiaz. Networked Migrations is a practice-based research project which explores through telematic sonic improvisatory performance practice the 'in-between' space in migratory contexts. Escribe tu e-mail para seguir este blog y recibir notificaciones de nuevos posts.